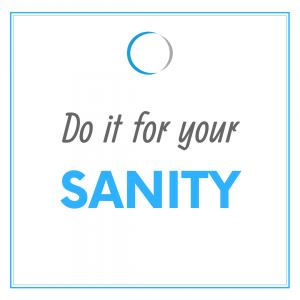 Do it for your sanity! In over seventeen years in working in fitness, I have found the most common motivator for people to exercise is their appearance. Whether 18 or 81 years of age, most people start exercising to either lose weight, trim the waist or banish the bingo wings. There seems to be a constant craving to have our bodies look better than they are right now. Media influence has meant that as a society we tend to link exercising with aesthetic achievement. We are constantly exposed to images of the “perfect” body type and told what we should be aspiring to. ”If you want to look like the latest body-revealing celebrity, you need to exercise” is the message. There is nothing wrong with that, regular exercise can indeed help all of us improve the way we look and if that brings commitment, it has to be a good thing. 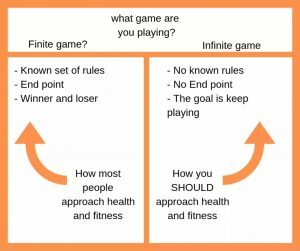 Do you have a “Finite Game Mentality”? 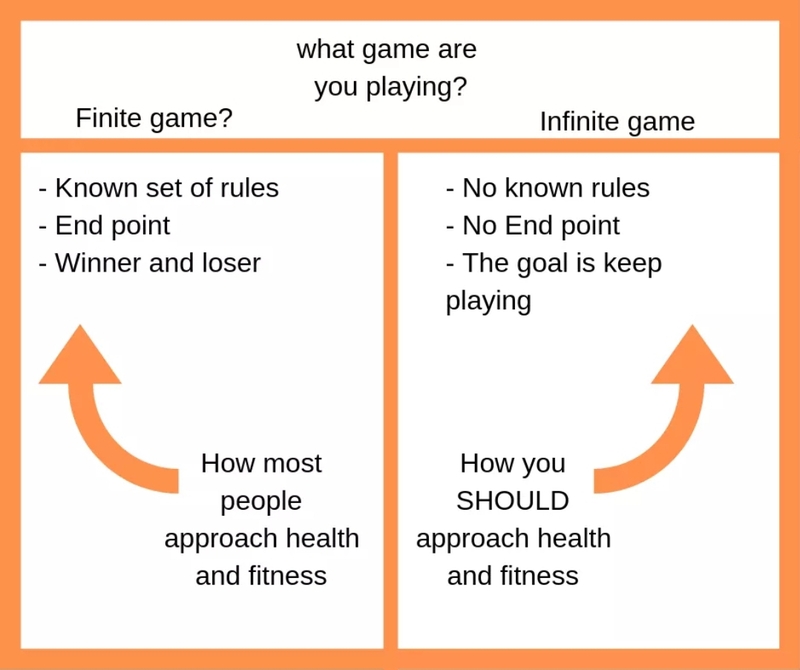 Where this type of aesthetic motivation falls short is that this takes us to a “finite game mentality” where there is an end point with a win or a loss. A perfect example would be an upcoming summer holiday where a target is set so you step up your healthy habits in pursuit of your goal. The holiday arrives and if you don’t achieve your goal, you feel like a failure. If you do achieve your target, you soon let the reigns loose, the bad habits creep in and it seems like you’re back to square one again. 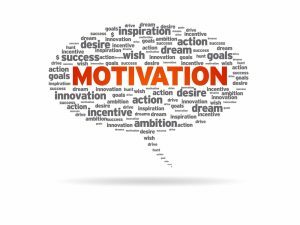 To ensure the best chances of keeping motivation high it may be best to switch to an “infinite game” mentality, where there is no end point and the goal is to simply keep playing and adjusting strategies as you develop as a person. Maybe you could switch your motivations to exercise to things like making everyday activities easier, feeling stronger and fitter, the illness protection that exercise provides or just living a longer life. I trained with international athletes for years with a finite game mentality where you would simply do everything it took to achieve your best performance. As I approach my 40th birthday, aside from the odd fitness challenge through the year, sporting success is less of a motivator now. I have switched to an infinite game mentality. My primary motivation to exercise is now to simply keep my sanity! In life, sometimes anxiety can take hold as our thoughts run away with us. The pressures of life build. An hour to escape “real” life with a tough fitness session, where you get in the zone and challenge your limits can be all it takes to bring you back in the present and give your mind that reset it needs. Many of our members are hard-working business professionals, busy committed parents or both. With many life pressures, they find those couple of hours of group personal training each week is dedicated time for themselves to banish the stresses of the week away, get fit and socialise. Leaving the studio on a high and ready to take on the world again. One member even called it her “sanity hour”. Make exercise a priority for you this week. 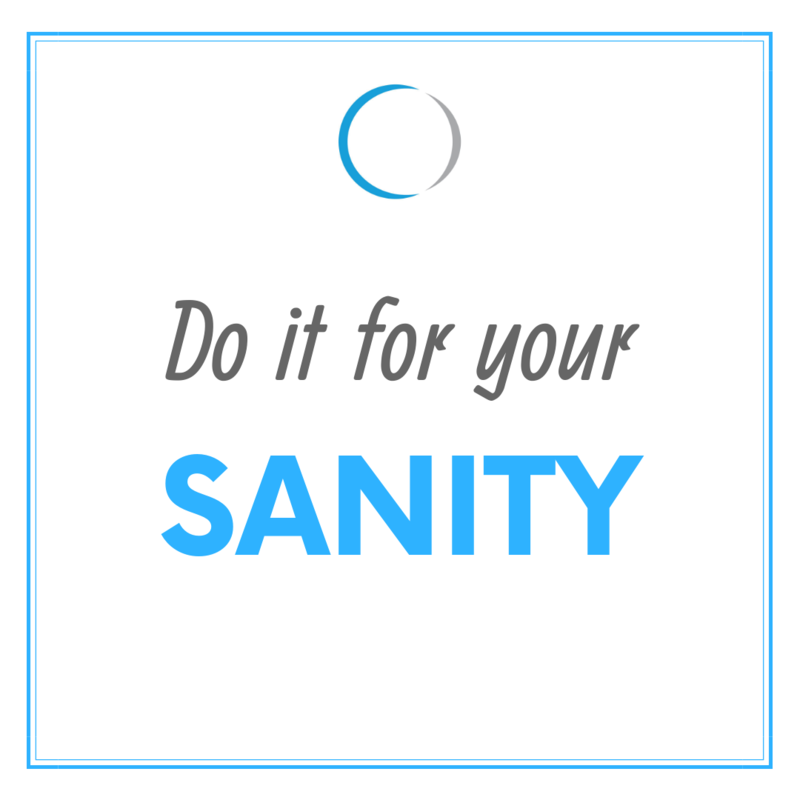 If for nothing else, do it for your sanity! http://www.insideout-pt.co.uk/wp-content/uploads/2016/03/logo4-1.png 0 0 Marc Malone http://www.insideout-pt.co.uk/wp-content/uploads/2016/03/logo4-1.png Marc Malone2019-03-24 12:16:482019-03-24 12:24:49Do it for your sanity! It’s the end of February, next week is the start of March. Time sure is flying in 2019! How are you getting on with sticking to your new year’s resolutions? If you made plans to exercise more, eat healthier and take better care of your wellbeing, have you been making this a priority? Hopefully you have built a healthier regime and are sticking to it and enjoying the benefits. No need to feel guilty if not, life is way too short to beat yourself up! At this time of year the gyms gradually start emptying out and fitness class numbers fall as motivation fades. Habits from the past suddenly come creeping in again and the goals you set at the start of the year fade into insignificance as life commitments take over. You are not alone; almost all of us will have peaks and troughs in our motivation – times when we are living healthier or going off-track. We are human after all. Why is it important for you to live a healthier life? To live a longer life, look better, feel more confident, avoid illness and disease, feel stronger and fitter, able to carry out everyday tasks easier, to reduce stress, for sporting achievement, for your family. Whatever your reasons to live a healthier lifestyle, keep these at the forefront of your mind. 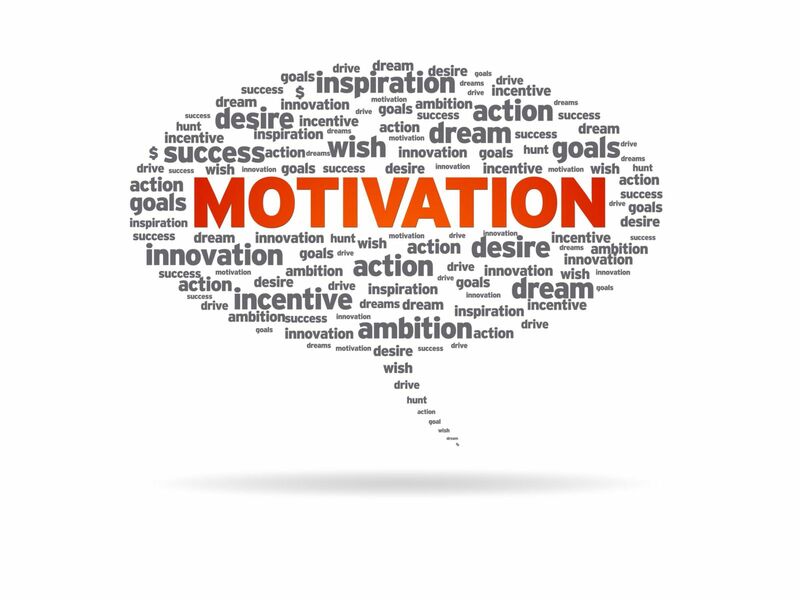 You can write down your main motivators and display them somewhere that you can see them often. Setting the goal of 10kg weight loss or taking part in your first 5K run can be a daunting prospect. By breaking down this goal into smaller steps you can keep working towards your ultimate goal. Start with outlining your longer-term goal and work back from there. A 10kg weight reduction by Christmas is approximately 1kg weight loss each month, half a pound a week. If you want to run a 5K, start with 30seconds of running and build up week by week (the Couch 2 5K app can help with this). Smaller goals are less daunting to achieve making you more likely to keep taking those steps forward. When you have achieved a task add a healthy reward directly after to reinforce the behaviour and make you want to repeat it. 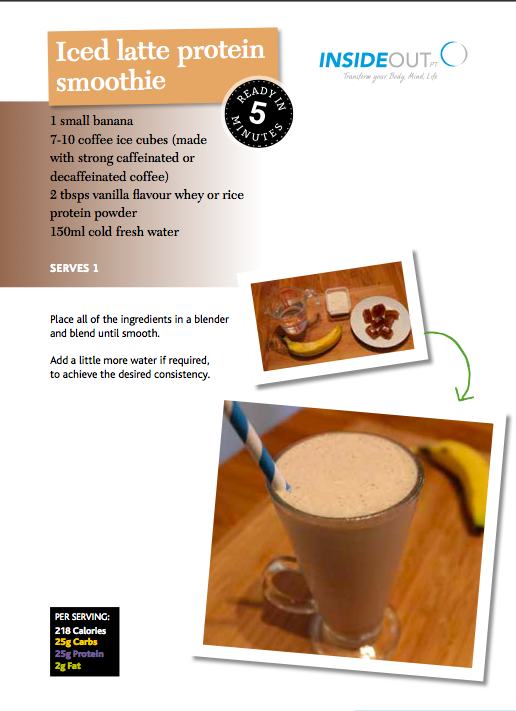 Maybe after your exercise session you have a tasty smoothie ready to drink. Perhaps you could put the money you were going to spend on treats/alcohol/takeaways etc. in a separate account and exchange for a significant treat like a massage at the end of the week/month. If your aim is to go to bed earlier, build a wind-down routine that includes something appealing like a relaxing bath, or enticing book to read. Anything positive that makes you want to stick to your new habits is a good thing! A training partner can help keep you accountable and help you to stick to your healthy routines. Make sure the buddy you choose is also focused on improving their health and well-being too and not the type that will suggest going out for drinks instead of hitting your exercise routine! Rather than taking an “all or nothing” approach which can be difficult to maintain in the long-term, try focusing on getting the balance of sticking to healthy habits 80 percent of the time, which gives you 20 percent leeway to let the reigns go, without feeling guilty about it. We are all likely to fall off the wagon at some point. 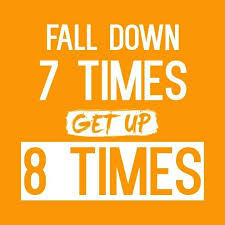 When this happens, what counts is how quickly you get back on track! Don’t beat yourself up, put it behind you and resume the journey towards your goals as soon as possible. Stay motivated and keep working towards achieving your wellbeing goals in 2019! You can do it! Why wait until January to get started? I don’t know about you, but I can’t stand January. Especially the first couple of weeks of the month. It seems the weather is always pretty dire and the daylight hours are at their shortest which can be quite demoralising. After a period of complete shut down around Christmas and the euphoria of a New Year’s Eve celebration of the achievement of making it to another year, all of a sudden there is a huge bump as you land straight back into the reality of day to day life. The other day, it dawned on me that what is compounding the problem is that from mid-November a small voice in my head was already starting to say “don’t worry about that for now, you can just start in January.” And that’s six weeks before the end of the year! Sound familiar? I maybe a Fitness Specialist but I am human too! Six weeks of letting good habits slip – laziness increasing and apathy towards nutrition choices building. Is it any wonder that when January 1st arrives with an expected instantaneous habits transformation, this seems so unobtainable when you have moved so far away from the better habits you had earlier in the year?! Habits are not formed overnight. Both good and bad habits take time to form. By choosing to “let things go” starting from November, you are giving bad habits the chance to ingrain and become the norm. Your default health position becomes lower and so it can take a few weeks to just get back to your pre-November healthy routines, let alone improve on this and move to your ideal state of well-being. This can be demoralising in January as you wonder how it has suddenly become so hard to shake off the bad habits you picked up in December. Start 2019 early – use December to get a head start! This year, I am doing things differently by deciding to use December as a head-start month in which I ignore the small voice in my heading putting things off until January and keep the healthy habits going through this wind-down phase of the year. Maybe you could do the same? This is not an Ebenezer Scrooge, Bar-Humbug approach to Christmas. No one is saying you have to be perfect or not enjoy yourself over the festive period. You can still have fun at your work parties and social events! If you have lots to attend, maybe you could pick the one or two that means most to you or will be the most fun to totally let the reigns go, and at the others still enjoy yourself but take a more measured approach. It’s all about balance! You can still make time for regular exercise and being physically active during this month too. You could make a commitment to go for walks at lunchtime, get some use out of the gym membership you are paying for or you could even start a new fitness routine so that you have a head start in taking steps to where you would like your health to be in 2019! Support is available to get your 2019 off to a brilliant start! If you are looking for some support in building some new habits for 2019, you could sign up for a 6-week kick starter membership with Inside Out PT. 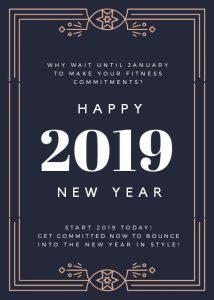 With fun group personal training sessions, nutrition and well-being guidance and a community of members that will support you on your journey to better health, you can start building new habits and routines over the next few weeks and hit the ground running in January. We are currently offering a 25% discount on our 6-week kick-starter memberships and as a bonus if you sign up before 31st December we will offer you an additional week, so 7 weeks for the price of 6! Register to take part in a free taster session to give Inside Out PT a try. If you like training with us but your schedule really is congested, you can start your 7 weeks of training and support in January. Keep it 80:20 this December! To start your 2019 in style this December, stick to the 80:20 rule throughout the month – being health conscious 80% of the time, will mean there is still plenty of fun you can have with the free 20%! 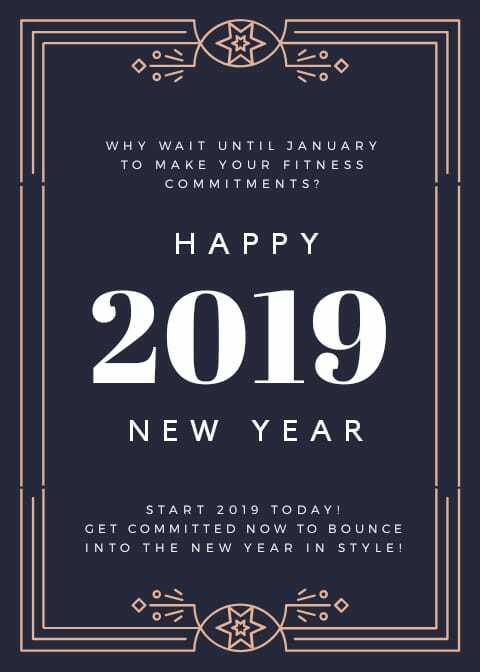 Being committed will mean that you’ll be able to enjoy the festivities, knowing that you also taking steps to be bouncing into January 2019 with better health, more confidence and a feeling of empowerment! My 2019 has started on 1st December, start yours now too! http://www.insideout-pt.co.uk/wp-content/uploads/2016/03/logo4-1.png 0 0 Marc Malone http://www.insideout-pt.co.uk/wp-content/uploads/2016/03/logo4-1.png Marc Malone2018-12-02 14:32:192018-12-02 14:32:19Why wait until January to get started? 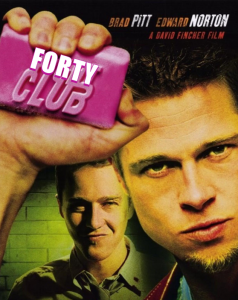 The first rule of The 40 Club is that you do not speak about being 40! Forty can be a time of great reflection. As age catches up with us, we realise that our bodies no longer function in the same way it did as when we were in our twenties. We need to develop new strategies to ensure our bodies and minds are functioning at optimal health, now and in the future. How do you want your well-being to be in your forties and beyond and how will you get there? Join three Edinburgh well-being experts – Fitness Specialist, Marc Malone; Nutritionist, Dr Laura Wyness; and Life Coach, Emma Dempsey for fitness, nutrition and life coaching to get a motivational boost and develop new strategies to live a healthier, happier life as we approach middle-age. 🏋️‍♀️🏋️‍♂️🏋️‍♀️ Set Your Fitness Plan with Marc – A unique fitness session featuring exercise planning and goal setting. 💭💥💭 Banishing Limiting Beliefs with Emma – This workshop will examine who we are and what beliefs are limiting us from reaching our wellness potential. 🍎🥑🍎 Decoding Diet Myths with Laura – There is a lot of misleading info in the media about what is the best way to eat healthily. 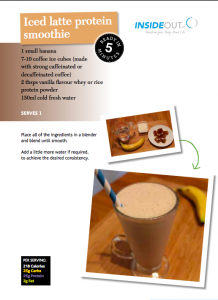 Get new tips and set your personal nutrition plan. You will be working in groups of six during the day to ensure you get the tailored support that you need to make real life changes. £40 per person. A light lunch is included. http://www.insideout-pt.co.uk/wp-content/uploads/2016/03/logo4-1.png 0 0 Marc Malone http://www.insideout-pt.co.uk/wp-content/uploads/2016/03/logo4-1.png Marc Malone2018-10-20 12:34:462018-10-20 17:07:20The 40 Club! So many people are paying for gym memberships that they never use. I am reading a book by Adam Kay named “It’s Going to Hurt” the secret diaries of a junior doctor. Apparently he had a show in the recent Edinburgh Fringe Festival. In the book he is recommending that one of his patient’s starts exercising to which the patient responded: “I have a gym membership, I just haven’t attended in about £3,000”! I laughed. The book has some hilarious lines and is definitely worth a read. But then as I reflected, it hit home that this is a similar predicament that people often find themselves in. Many people see the gym as the answer to their physical inactivity, paying their monthly membership fee in the hope that they will find a sudden boost of inspiration and start attending on a regular basis. Regular attendance is of course the key to getting the benefits to their body and mind that exercise provides. Sometimes this happens. Maybe there is a holiday approaching or a big event, so they start attending again and getting results. Post event, they fall out of the habit and when they do attend they find themselves doing the same routine, which soon gets boring so they fall out of the habit. Sound familiar? Months pass by with no gym attendance and yet the direct debits keep leaving the bank account and next thing they haven’t attended in £3,000! Maybe there is another answer to your lack of physical activity. A way to keep motivated to exercise on a regular basis. Having fun getting fit. Being inspired by others. Getting support from experts that genuinely care about you and keeping you accountable. Have you ever tried Semi-Private Personal Training? In over 15 years’ experience as a personal trainer I have never seen people push themselves further than in small group PT sessions. The inspiration effect from others seems to take their efforts to a higher level. This leads to better changes to your body. You can train twice a week for less than the price of a one to one personal training session. Government guidelines recommend we do strength building activities at least twice a week. Tick! And training twice a week rather than once also leads to better results. Bonus! Ever been to a fitness class or bootcamp and hid at the back. There may have been so many people that you didn’t even know if the instructor noticed you. Maybe you were doing the wrong technique and didn’t know. As there is a maximum of six people per session, you get the expert guidance you need and our coaches will keep you accountable to make sure you attend. 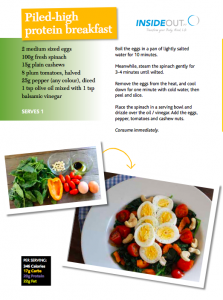 Our nutritionist will provide tips and advice to keep on the healthy track. You will get support from people on a similar journey to better health – sharing tips and advice and helping to overcome struggles and encouraging successes. You may meet new friends and meet up outside of PT sessions. Or take part in a team fitness event. If exercise is fun, you are more likely to attend on a regular basis. With different sessions each time you attend, your body will be challenged in new ways leading to better results and your mind will be stimulated so you won’t get bored! The fun challenges will help you to actually enjoy exercise! If you have a gym membership, make sure you make a special effort to attend this week. Don’t let another direct debit leave the account without attending. Make a commitment to a number of attendances this month and stick to it. But if you’ve decided that the gym isn’t really for you, maybe you could try semi-private personal training at Inside Out PT. We have over 15 weekly sessions to choose from at a beautiful location with an expert team and a vibrant community of members of women and men of all ages, shapes and fitness levels. Fill out a transformation application here or contact us at support@insideout-pt.co.uk to book your free taster session today, to find your love for fitness, eating well and self-care. 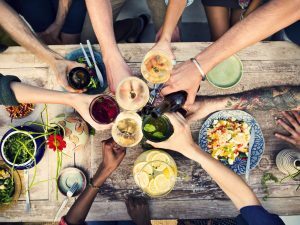 Are you one of the many people that finds it easier to make healthier choices when you are in your typical weekly routine but then struggle to keep in control at celebration events or social occasions? Sometimes all it takes is for one heavy night out to completely derail your healthy living intentions. Here are my top ten tips to stay on the happier, healthier track if you have an upcoming special event or social occasion to look forward to. If you know you have an event or social occasion approaching, plan a healthy week in the lead up to the event – get lots of exercise in, have healthy meals and snacks and limit the sweet treats and alcohol. An exercise session on the day of the event will put you on top form, feeling energised and in a good mood with your body feeling that little bit firmer! Great for feeling good about yourself. Many people make the mistake of doing the complete opposite, practically starving themselves the day of the event. When you are in a state of hunger, your body craves fats and sugar more. Eat first and you will have more control and make better decisions. Pick a simple rule for the evening that will keep you focused. You could try; not having any nibbles, only having two courses, having a glass of water between drinks. Whichever personalised rule you make for yourself, stick to it! If you are the designated driver it will be easier to refuse alcoholic drinks when they are offered. If you are planning on drinking alcohol, a glass of water between drinks and choosing a lower calorie/sugar option, can act as damage limitation! Many people have special dietary requirements these days. You have yours also. Although they may not be allergy related, if you are trying to eat healthier, perhaps you could let your host or the people you are with know. We all need to be healthier and they may be inspired to plan a healthier menu for everyone because of you request! Sit away from the nibbles! Not eating before you go can lead to feeling like a savage beast when the nibbles are sat down beside you! If you never got a chance to eat first, move to a place where the nibbles are out of reach! Sometimes you may not have control over what you are served, but you will have control over how much you eat. Ask for a smaller portion. If you’re at a buffet choose a smaller plate. Eating before you go will give you control over this too. In advance of the event, ensure you have your cupboards stocked with healthy foods so that there is no excuse that can stop you getting back on track as soon as possible. This most important – a one-off event won’t do too much damage in comparison with days and weeks of unhealthy habits. Life is to be enjoyed and social occasions are the perfect opportunity to do so. 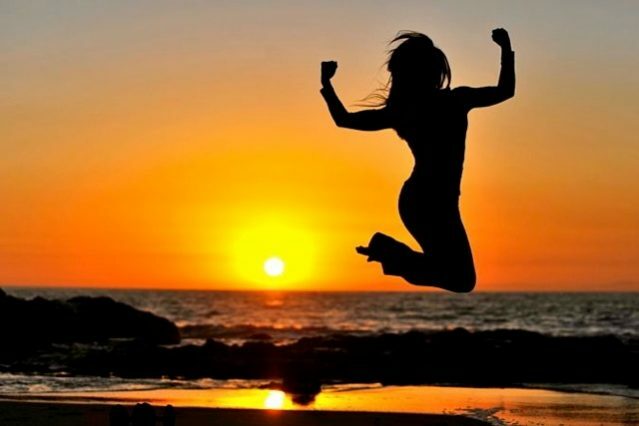 You can enjoy yourself whist also feeling empowered that you are in control and making better choices. Whatever the outcome, never beat yourself up, just accept what’s happened and move on as quickly as you can. It’s not how you start that matters, but how you finish! http://www.insideout-pt.co.uk/wp-content/uploads/2016/03/logo4-1.png 0 0 Marc Malone http://www.insideout-pt.co.uk/wp-content/uploads/2016/03/logo4-1.png Marc Malone2018-04-16 00:33:452018-04-16 01:01:40It's not how you start that matters, but how you finish!